Indiana had a late spring, which meant a somewhat delayed start to the garden growing season. But in the space of a few weeks, I’ve gone from begging my plants to produce to trying to find ways to use up the herbs and cherry tomatoes that are exploding from my garden boxes. Hubs had grilled up a bunch of chicken breasts to use throughout the week, and a couple of days ago, I found myself the only one who really needed cooking for. (Hubs had a late lunch and the kids…hmm…I’m sure they ate something.) At any rate, I was looking for a non-salad, quick-to-make side dish for my chicken. I picked up my copy of Simple Suppers, which had been a gift from my dear friend Melanie several years before. 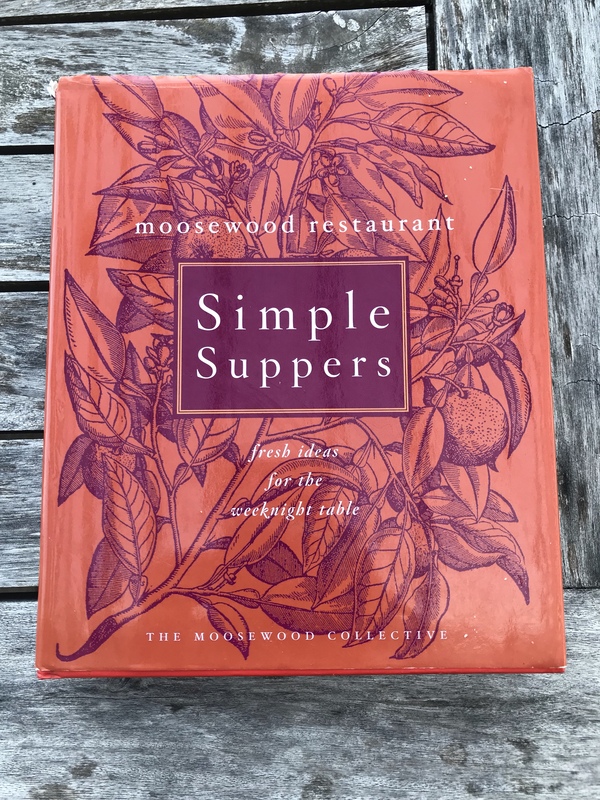 It’s one of the many cookbooks from the Moosewood Restaurant, a vegetarian restaurant in Ithaca, New York. 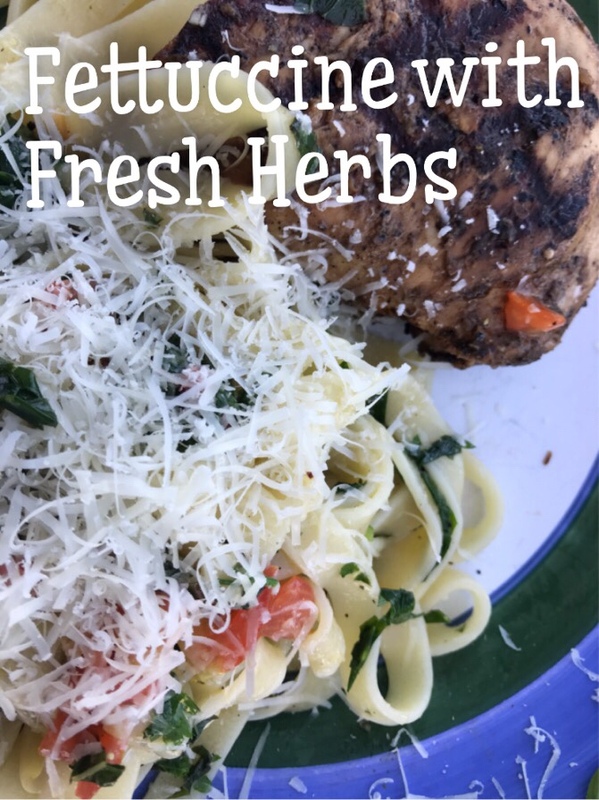 (I have several Moosewood cookbooks, and they are fun to read and filled with great recipes) I was originally looking for a rice recipe, but the Fettuccine with Fresh Herbs looked really good. PLUS – I had all those herbs – parsley, basil, and chives – in great profusion. There was also a half-empty bag of fettuccine in the pantry that needed to be used up. So, off I went to snip, pick, and cook! The next time I make this, I will increase the herb amounts by about 50 percent. I like lots of herby flavor! Prepare the garlic and herbs. Warm the oil in a small pan on low heat, and cook the garlic for about a minute. Don’t let it brown. Add the herbs and cook for about 30 seconds, stirring constantly. Remove from the heat, and add a ladle of the hot pasta-cooking water. Stir and set aside. When the pasta is done, drain it. Pour in the oil-herb mixture and toss to combine. Add the salt and pepper, and I threw in a few chopped cherry tomatoes because we have so many. Serve with grated Parmesan cheese. Oh yes! This would be a great side dish to serve for company. I would increase the amount of herbs, and definitely include the tomatoes again for a tasty summer dish. The next day, I cut up another piece of chicken, sauteed it in a pan, and added in the rest of the leftover pasta for a great meal. I added a splash of balsamic vinegar to the pan and few more herbs to boost the flavor a bit. Yum!